Before I start trashing this film the way it really deserves, I should probably admit I was never a real fan of the original. It’s the kind of film that people always seemed to admire for its technical achievement, but even as a kid I never quite got into it. In fact, dare I say, I remember thinking it was all rather boring and overly complicated. Let’s just face it, most of the fun and the enjoyment in that first film was actually watching the video-games-like sequences (and yet even those, I remember thinking even at the time, were over-edited and I couldn’t quite enjoy them fully). The rest was pretty forgettable. Of course, back in the 80s I probably had the video games, I had the little Mattel characters, and even a notebook for school with Tron written on it… but back then, the times were different and there wasn’t much to choose from for a boy of ten like me. Anyway, it doesn’t look like I am the only one who thinks that, since the first TRON ranks pretty low on the internet movie database and rotten tomatoes gives it an unremarkable 68% (Most of which surely has got to do with the nostalgia factor). Hence the reason why it took them almost 30 years to make a sequel. Having said all this, I can safely say that Tron Legacy manages to stay true to the original: it’s just as complicated and confusing in its “story”, the video-games-like sequences are just as messy and over-edited as the original and the special effects want to be absolutely amazing, but actually when you really look at them closely they’re not as successful as they’re trying to make you believe. Much has been talked about the CGI wizardry that has allowed Jeff Bridges to look 30 years younger. Well, sadly, we are still a few years away to make that trick seamless. Even in Benjamin Button the effect on Brad Pitt young just about worked, but was still the least convincing of them all. Though it will probably look just about OK once the film comes out on a DVD (not so sure about the BluRay actually), certainly on the big screen, the effect on Jeff Bridges’ face doesn’t look quite right. Human skin has always been troublesome on GCI and this film proves it again. The result is a weird plastic feel that actually reduces his real facial expression. One of my readers said it made him look like “prince charming” from the Shrek movies, which I think it hits the nail right on the head!! Interestingly it seemed to work better in the scenes which were masked and filtered through a TV screen (as if they were part of archive footage), which proves that even the makers were quite aware of the limitations. The film is quite a visual feast for the eye, as special effects and production design fight for attention in every single frame of the film , but it’s all so hyper-real and over-blown that, to be honest, I found it hard to be swept away by any of it. I do recognize some of its value (which is why I am giving it 5 stars and not 2 stars), but all this visual extravaganza cannot make up for the lack of any clear and interesting storytelling. And this is, at the end of the day, the most important factor in a film, any film, whether it’s an action piece or a drama, or a cartoon. : you’ve got to like the story! You’ve got to sympathize with the characters or at least be interested in them. 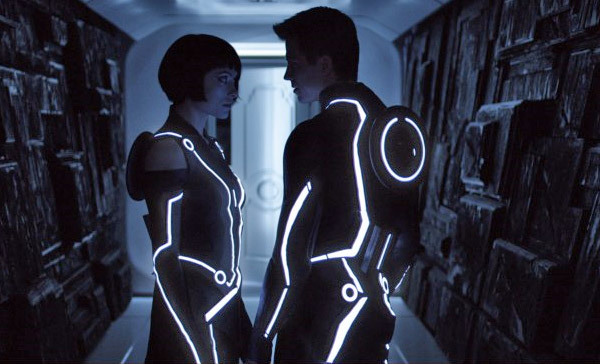 In the case of Tron:Legacy I was pretty confused all the way through (but sadly not in a “Inception” sort of confusion where, being confused is part of the fun. This was just confusing because it was badly told!). I am not really sure who is this film for? Fans of the first one? Well, there are not too many out there. Is it a film for kids? Don’t think so: they would certainly get lost in the mambo-jumbo story. Is it a film for video-games lovers? Probably, though I can name hundreds of much more exciting games to play. Is it a film for girls in love with Garrett Hedlund? Well, there’s plenty of him in here and he does an OK job with the material he’s given, but to be honest that’s not a good enough reason for watching this film. Is it a film for geeks or special effects lovers? Well, I am one of those, and I can tell you that I wasn’t really taken by any it. It all may look slick and stylish and it’s all just an upgraded version of the previous film, with very little originality. Even the action sequences seemed just a modern version of the previous ones, with some added 3D Fx. Ah yes, I was almost forgetting the 3D factor. Right at the beginning some weird caption tells you that some of the scenes are supposed to look 2D and that you should keep your 3D glasses on all the time. What it actually means is that the 3D only kicks in once the main characters enters the virtual world of video-games (quite a bad choice if you ask me, especially because it misses quite a few opportunities in the first part of the film to make the action a bit more exciting). Once we finally get to “virtual world” or cyber-word or whatever you wanna call it, after the first few minutes you’re in 3D you actually almost forget you’re watching it in 3D (I say almost because the headache that the 3D glasses give you is still there). I was so surprised by how badly the 3D is used on this film. Even the flying sequences didn’t seem to draw me in ( and those are notoriously good on 3D, see Avatar and even the awful Legend of the Guardians: The Owls of Ga’Hoole). Am I alone on this one? I usually love 3D… I seem to remember the motorbike sequences on the first Tron being a lot more exciting than in this (or is it because I was 10 at the time?). On the acting side of things (and I am aware that one doesn’t really go and see Tron for the acting), Jeff Bridges in his older self (not the plastic young version) seems a little bit embarrassed to be in this film, in a mixture of the Dude and a Jedi knight… And talking about Star Wars, not only Jeff Bridges dresses like a Jedi and the special effects are sometimes reminiscent of the Attack of the Clones, but even the main protagonist, Garrett Hedlund looks a bit like Hayden Christensen.And finally Michael Sheen, is now the parody of himself and doesn’t seem to have any more regard for choosing whatever part in whatever film as long as he gets paid (well, who could blame him? I’d probably do the same). So, to wrap it all up: the story is a mess, the script if basically riddled with clichés, bad lines and jokes that are so poorly timed and unfunny that in the screening where I was NOBODY laughed, and finally the visual effects are so unreal and overblown that they fail to amaze. One the positive side, the soundtrack is awesome. Nothing new, of course, it sounds a lot like Batman, Inception and the Bourne films, but it’s still pretty good (though there was probably too much music throughout).